The EPA has established six hazardous air pollutants (ozone, nitrogen oxide, carbon monoxide, sulfur dioxide, lead and particulate matter) that pose significant impact on human health. The State of New Jersey and the federal government have set concentration standards for these principal pollutants to protect the public health and prevent environmental damage. 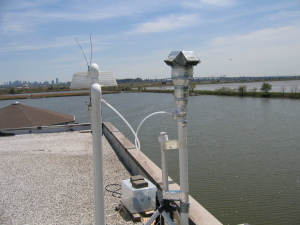 To ensure that the Meadowlands District attains these standards, the New Jersey Sports and Exposition Authority (formerly NJMC) has been monitoring ozone, nitrogen oxide, carbon monoxide, sulfur dioxide and carbon dioxide since 2007 to determine the impact of major pollution sources, to measure background levels, and to measure secondary impacts in rural areas. 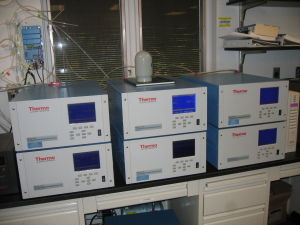 Samples are collected by Thermo Scientific five i-series gas analyzers installed on the roof of the campus building every minute for 24 hours a day. All the gas analyzers are calibrated weekly by following EPA protocol and using standard gases. The gas analyzers are also maintained monthly which include replacing air filters and gas purifiers for the quality control.